Boston Dynamics boasts that its robot Atlas is the world's most dynamic humanoid. To support its boast, the team reminds the world that Atlas uses balance and whole-body skills to achieve its two-handed mobile manipulation. A new video leaves little for argument. The video shows Atlas taking a jog. And gee, couldn't an unaided biped robot get some air without techies' headlines busting out all over? The answer was No. Atlas had no such privacy. His makers, Boston Dynamics, are happy to show it off to the world. Arms swinging back and forth, Atlas is a robot taking a jog through an All-American suburban setting, complete with white houses and tidy lawns. Atlas crosses over from smooth grassy terrain to unmanicured grass and ground easily. News outlets were impressed by the way it showed no awkward interruptions in keeping its balance on grass or uneven ground. Then it came across a log standing in its way. The athletic Atlas squatted, pulled itself up, and jumped over the log. Catching site of it all, The Guardian took a long view of just how far Atlas has grown from its coming up in the world of robotics. "Three years ago former Google robotics outfit Boston Dynamics demonstrated its Terminator-like humanoid Atlas robot running through a forest tethered to a machine. Now that same hauntingly human robot can now run across and navigate uneven terrain unaided, bounding over the trickiest of obstacles … such as a log." Eric Mack in Forbes said, "Atlas seems to have gone from a slow stroll in the woods to a brisk jog very quickly. It is certainly developing at a more rapid pace than most of us develop our cardiovascular fitness, and of course, the human body has limitations that well-engineered machines do not." IEEE Spectrum: "Jogging involves a flight phase, which means that the robot is spending time completely airborne during each gait cycle. It takes much more energy to do this relative to walking, which is more like a continuous controlled fall forward. 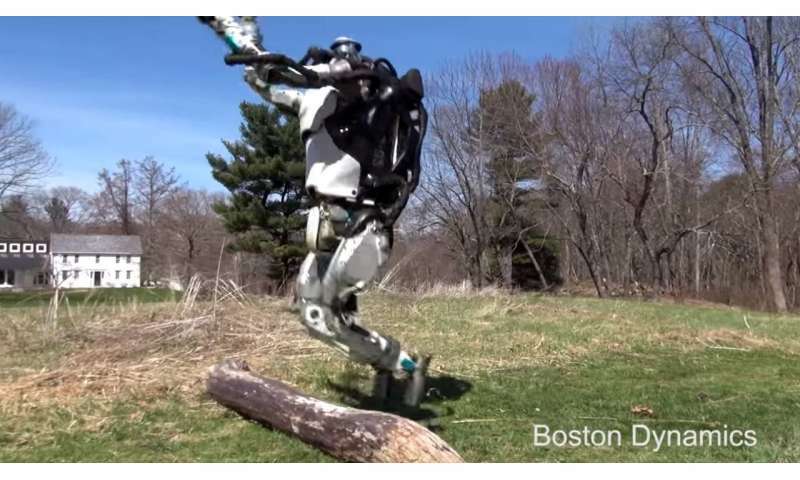 Atlas even looks kind of human-like as it jogs: You could almost (almost!) imagine a human jogging in the same way." Its sensor setup includes stereo vision and range sensing. Further, the Boston Dynamics site said "Atlas hardware takes advantage of 3-D printing to save weight and space, resulting in a remarkable compact robot with high strength-to-weight ratio." One can be forgiven if you forget to blink during this video. It's one thing to see a humanoid on the lab floor on a treadmill, being kicked and poked by humans to see if it can avoid falling over. It's one thing to see an escorted-by-humans robot outside the lab in the dead of winter, stepping over icy slabs and climbing a little hill. This is an outdoor video that looks as if it could be an episode on reality TV. With Atlas, the robot is becoming more fluid in its motions with strides that more closely mimic that of a human, said Hot Hardware. So, what's the takeaway? The considerable step-up in Atlas' skills did not escape the attention of Interesting Engineering. "Atlas's movements seem eerily natural, as the legs parallel the movement seen in most people who jog recreationally. Atlas's arms swing as well, keeping the system balanced and the momentum going." As for the log-hop, Interesting Engineering was impressed over its "landing perfectly balanced on the other side." The clip is one of two new videos from Boston Dynamics. The other shows the company's SpotMini, which is a dog-like robot. It was announced at a conference that Boston Dynamics will begin selling SpotMini next year. Wait, did I just see Atlas robot do a backflip? Put a weapon on that bot and it's the scariest thing I've ever seen.